On Monday, we had the big hike. The camp walked an entire 14 joyous miles together. After the first half, we rested and ate delicious sandwiches that the volunteers prepared for us. Afterwards the campers were driven on a surprise trip to Megz Country Cheese Inc, a local ice-cream parlor in Davis, IL. The selection of ice cream was mind boggling and everyone enjoyed their cold tasty treats. Afterwards, the campers were given the opportunity to walk an extra 5 miles. The whole camp was excited to receive a hiking badge on the last day of camp for their hard work. For Varka this week, there was a breakfast twist. 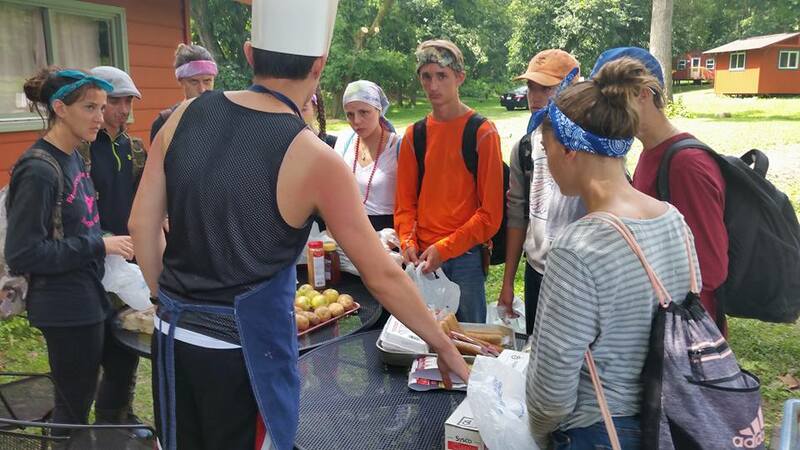 This time, the cabins had to prepare a breakfast dish along with their soups. 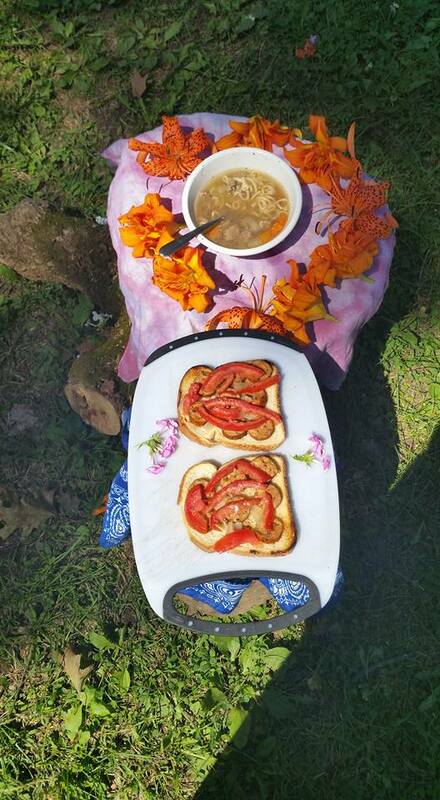 The counselors set up a table with ingredients and the cabins took what they needed. The dishes were amazing! Sausages, omelets, and other creative dishes were prepared. The soups were delicious as well, all the experience gained throughout the month allowed the cabins to make their best soups yet! 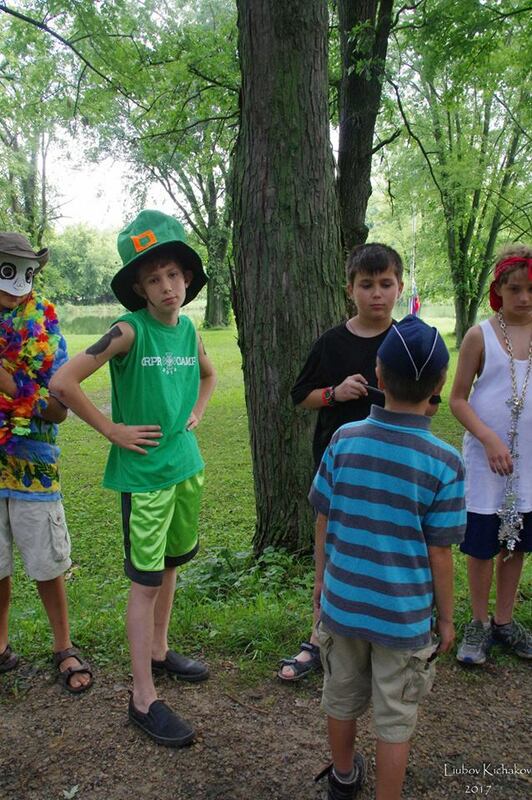 One highlight of this week was an activity called “Judgement Day” where campers were given silly judgements by the nachalstvo which they had to fulfill on the next day. The campers were giggling at the silliness of the event as they anticipated their names being called up next. This is the one event where each camper had something highlighted about them that would bring out their inner goofiness! Let’s not forget the epic “loud raid” that happened this week, where the boys camp and the girls camp had a massive shaving cream fight in each camp. Spirits were high as each camp was working together to try and outsmart the opposite camp in their raid tactics that they were using. In the aftermath of the raid, the campers were all caked in shaving cream as they walked back to their respective camps. On Friday, the winning cabins were announced and taken to town to enjoy the evening away from camp. They went bowling, had fresh oven baked pizza and ice-cream. That night, the campers had fun at the final dance. Although they were sad to say goodbye to their friends, they enjoyed dancing the night away in the barn. The memories they had here at camp will be with them forever. 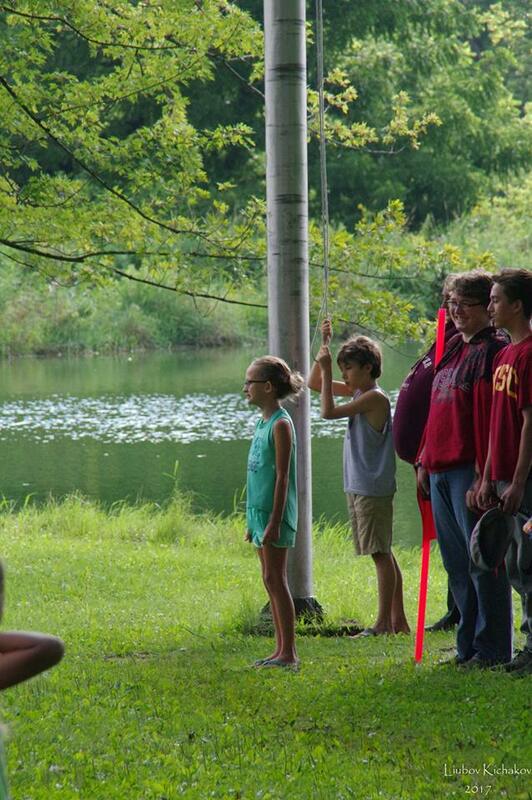 As the flags lowered that Saturday evening, the campers sang the “Preobrazhensky March” one last time. The campers stood there respectively admiring the last parade of the year. Campers were awarded badges for their hard work and efforts by Archbishop Peter and the nachalnitsa for the week. As the camp marched off the peninsula and the last stroi was dismissed, everyone took a group photo, concluding the 57th annual camp session. There were tears and hugs as everyone begun to leave. The gates once again stood there symbolizing the barrier of camp and the outside world. The memories made here for the four weeks will be taken back and remembered for a lifetime. Until next year, the gates will stand and guard our precious camp. Our camp has some amazing traditions that have been passed down year after year. One of the camp favorites is to barbeque on the beach. This annual camp picnic is a great time for campers to sit back, relax, and enjoy their evening. The evening was filled with joy and laughter while cabins waited for hamburgers fresh right off the grill. The campers enjoyed to swim and play limbo while the music played in the background. After prayers, the kids feasted on the beach and socialized with their friends. It was a heartwarming sight to see when all the campers were socializing with their friends! On Sunday, we celebrated Vladimirovo Day with the annual ceremonial parade. 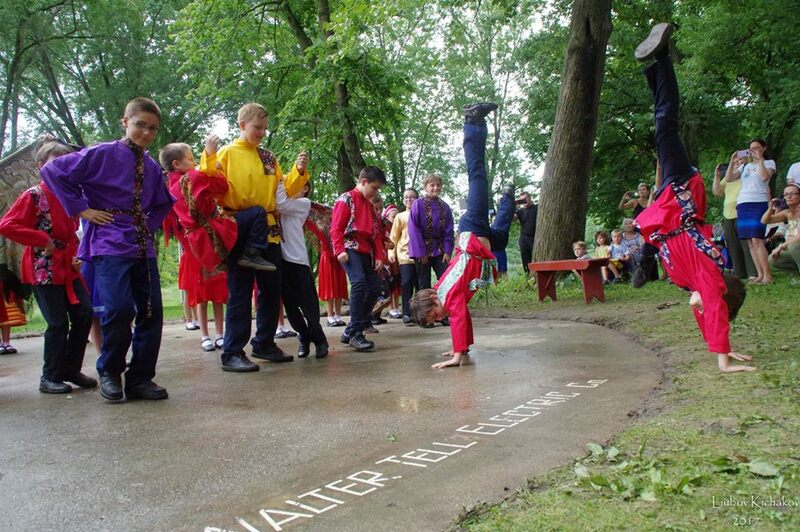 Afterwards the campers proceeded with the Vladmirovo Program. The campers performed various dances as well as a few musical numbers. After the program, the campers were free to spend the evening with their parents and relatives. Some picnicked on the camp grounds while others went for a swim on the beach. Despite the heat wave, and the small tad of rain, the campers and parents enjoyed their evening together at ORPR Camp. After a long week of preparation for the Vladimirovo program, the entire camp gathered in the evening at the cafeteria for a pizza party. The campers enjoyed their favorite pizzas and the company of one another. The week began with a popular memory game called Keem. During this activity, the cabins are to memorize items that they see during a certain period of time. This week, the counselors put a special twist on the activity. The twist consisted of the counselors simulating a customs security checkpoint where travelers brought items that were “confiscated” when the travelers where trying to get through. As the campers left the station, they had smiling faces. They proceeded with to write down their memorized items within a two-minute time limit. Typically, Varka is on Tuesdays here at camp. During our second Varka of the month, we had a “visiting” cabin come and join us for the competition. This “visiting” cabin was a group of nachalstvo that joined the campers in the competition. They were given the same materials to light and build their fire as each cabin. The twist given to the cabins; beat the nachalstvo cabin in lighting and boiling to receive extra points for the activity. One lucky cabin did beat the counselors and received bonus points for their hard work! The skits were fantastic and the soups were delicious. 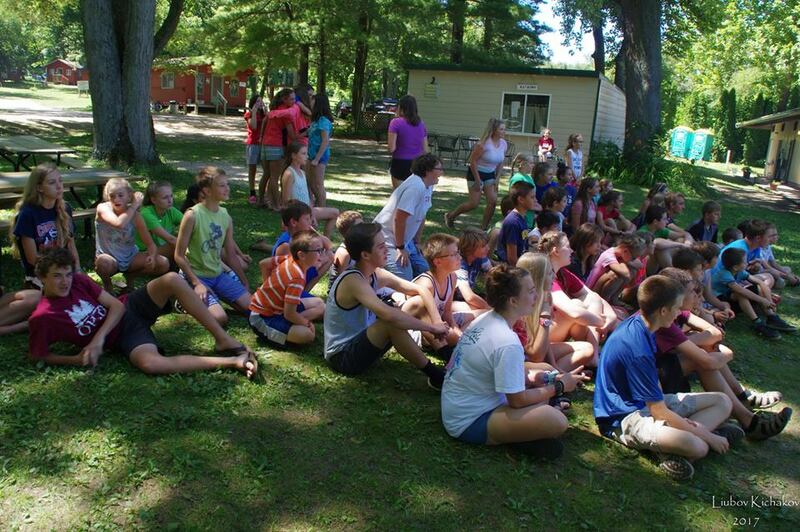 As the temperature climbed during the week, the campers needed a day to lay back, relax, and enjoy the sun. So as part of the activities planned for the month, the camp had a surprise trip to Splash Land. The campers enjoyed the day splashing in the water, going down water slides and diving deep into the pool. When lunch time came around, hamburgers were served fresh from the grill to the campers as they enjoyed their evening. Excitement was present throughout the day and the energy was eccentric! On Thursday, the campers had their second Beg themed with spies. Before the event the counselors told the story of a rogue agent who was leaking classified information from the headquarters. Cabins had to decipher codes, find hidden messages and figure out puzzles at various stations. This challenging yet fun activity was a great way to end the week. But wait! There was one more activity that the campers were looking forward to, and this was the first dance. The whole camp couldn’t contain their excitement from the moment it was known that the dance was happening! As soon as the doors to the dance barn opened, the campers danced the night away listening to a variety of different genres of music. When the last song played during the dance, the campers were already counting down the days until the next dance. It was an amazing sight to see all the new and returning campers drive in through the camp gates Saturday morning for the 2017 camp session. 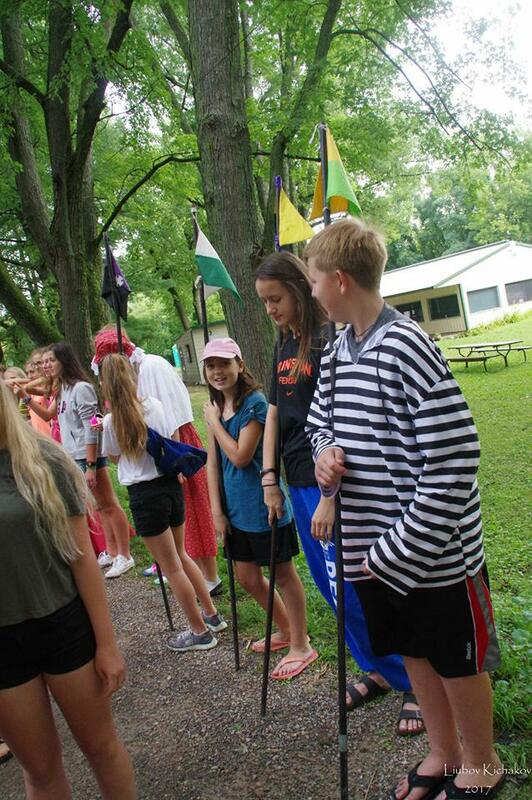 With excitement in the air, the campers were ready to adjust to their camp life and make new friends! That same Saturday evening, the campers participated in the weekly bonfire. Bringing with them the skits their cabins have prepared, instruments, and their talents to share with everyone. As everyone watched the presentations, the sun set and the night rolled in. 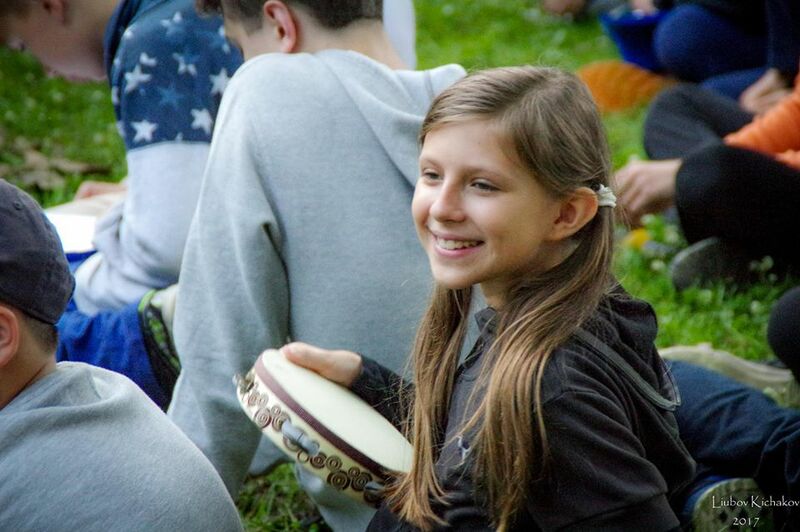 Campers joined their cabin leaders and counselors in singing traditional Russian folk songs, all while learning the traditions of ORPR Camp that have been passed down for generations. 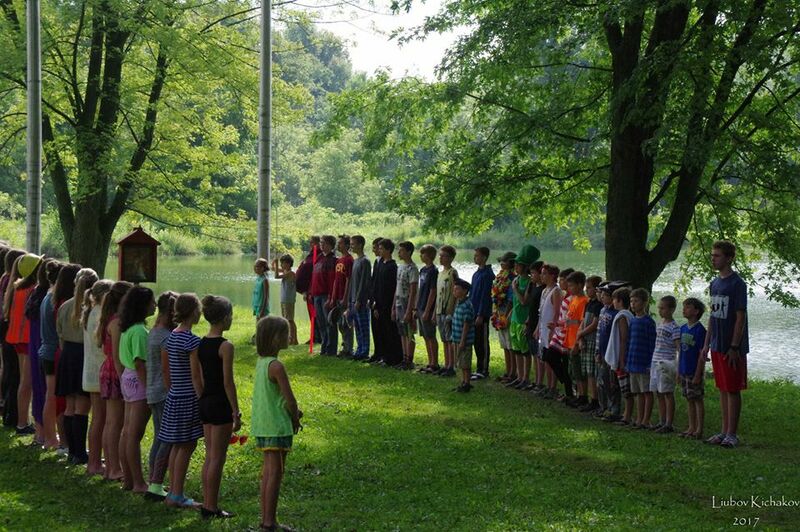 On Independence Day, the campers woke up the Star-Spangled Banner playing over the camp sound system. That day, the major event was Varka. Varka is a fun, yet competitive activity where each cabin must build and light their own campfire. After they have built a sustaining flame, they must cook soup for lunch. Since this event has taken place on the fourth of July, the campers dressed in red, white, and blue while the counselors dressed significant American figures from history. Throughout the event, there were sparklers shimmering and confetti pops booming. During the midst of it all, the cabins had to stop what they were doing when they heard God Bless America over the sound system and join in with the signing. This unique twist brought joy to all and honored our country. 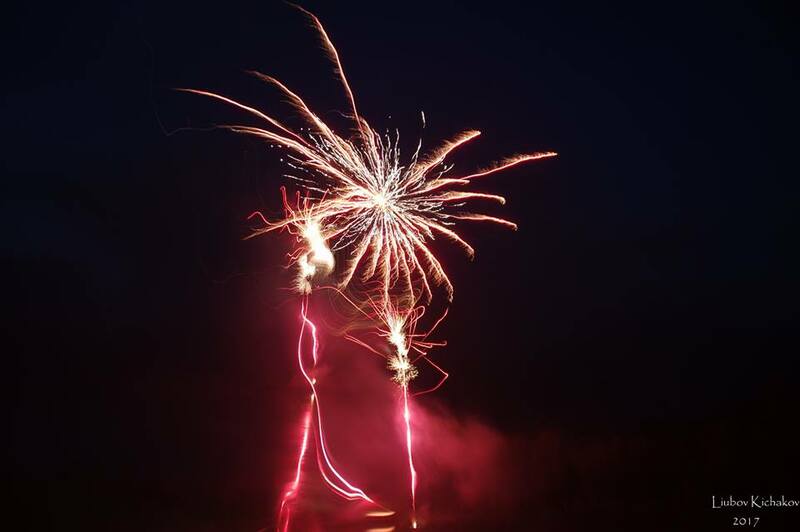 That evening the campers gathered on the beach and admired the fireworks, soaring high in the night sky. The ambient display was a great ending to our day. On Thursday, the cabins competed in another camp favorite activity called “Beg”. Beg is a scavenger hunt style activity that takes place in the woods. There are items hidden throughout the woods that normally wouldn’t be noticed without careful observation. During their hike, the cabins would encounter counselors dressed in costume. This week’s theme was “Clean Vs. Dirty”. At the first station the campers learned of two families with two very different lifestyles. There were a pair of brothers, who were exceptionally clean and a pair of sisters who were extremely dirty. The campers enjoyed going down mudslides with the sisters and getting caked with mud. Then they encountered the “Bubble Brothers” who had a super bubbly swimming pool set up to clean the campers from all the dirt. The cabins had a great time on the Beg getting dirty then clean. Not only did the campers have fun, but this activity promoted good hygiene. Upon their return, there was refreshing watermelon snack waiting for them. In conclusion, the first week was a huge success! Campers have made many new friends and amazing memories. The excitement continues as everyone begins to bond closer and closer together. On Monday, we had the big hike. As a camp, we walked 8 miles. After we completed the first leg of the hike, campers had the opportunity to walk an extra 4 miles. The whole camp is excited to receive a hiking badge on the last day of camp. Tuesday was a jam packed day. Campers participated in slip-n-slide kickball, varka, and keem. During slip-n-slide kickball, campers were slipping and sliding to each base. For varka, counselors set up a carnival game where the smallest camper in each cabin had to throw a ball in a bucket that had a certain advantage assigned to it. For example, some of the cabins won help from counselors and extra sticks, cabin leaders played a game where they had to get to the center of a tootsie pop without using their hands. For keem, campers played a game of "spot the difference." 4 of the counselors dressed up, showed themselves, changed subtle things about their outfits, then showed themselves again. The goal was for the campers to be able to utilize their recollection of memory for the very last keem. On Wednesday, campers woke up early to complete the mile swim. Some campers swam 1/2, 1 mile, and up to 3 miles!! After the swim, counselors held a camp wide Olympics! There was a potato sack race, a hula hoop game, and many more. At the "closing ceremony", each team was given a candy bar medal based on their ranking. In the end everyone was a winner! On Thursday, counselors scheduled the final the final beg. Unfortunately due to weather, campers couldn't participate. To replace beg, cabins competed in "burn the rope." in this activity, cabins must build fires high enough to burn through a rope that is tied across their fire pit. At night, we had a special event called "Русский Ужин." 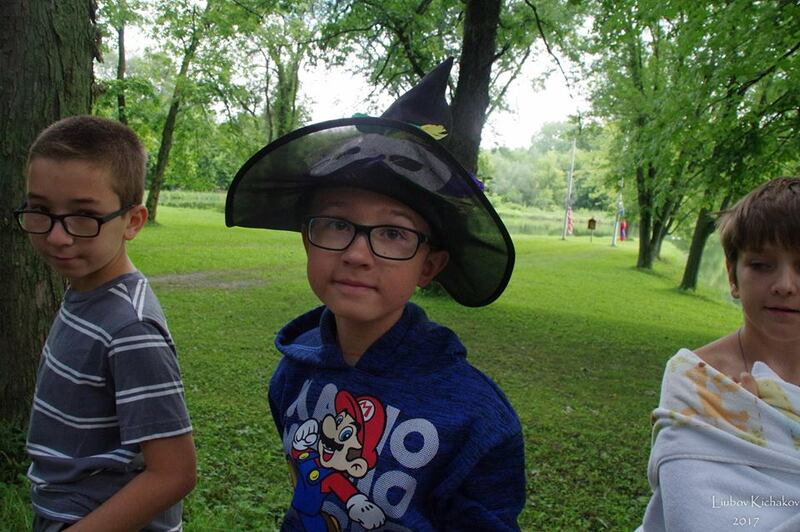 Campers dressed up for a amazing meal consisting of traditional Russian food such as stuffed cabbage rolls, pelmeni, shashlik (kebab), and drinks like kvas were served. 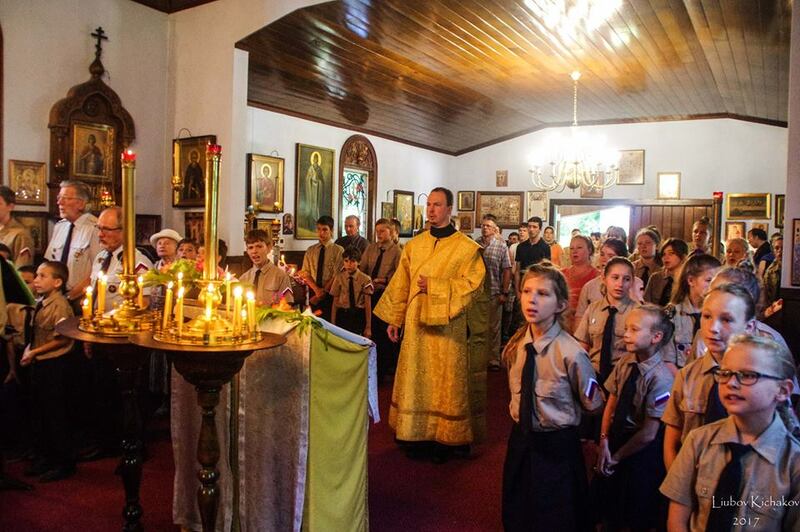 The counselors served the camp while wearing traditional Russian attire. On Friday, the winning cabins went to town to enjoy an afternoon away from camp. They had pizza, ice cream, and watched a movie. At night, campers had lots of fun at the final dance. Though campers were sad to say goodbye to their friends, they had a lot of fun dancing the night away in the barn! After another fun hike the day before, cabins competed in another "keem" activity on Monday. This week, the counselors dressed in all black and taped glow sticks on their backs to form different shapes. Cabins had to memorize the shapes and who was wearing each one. Though it was difficult, the campers had fun watching the light show! On Tuesday, cabins competed in another "beg". 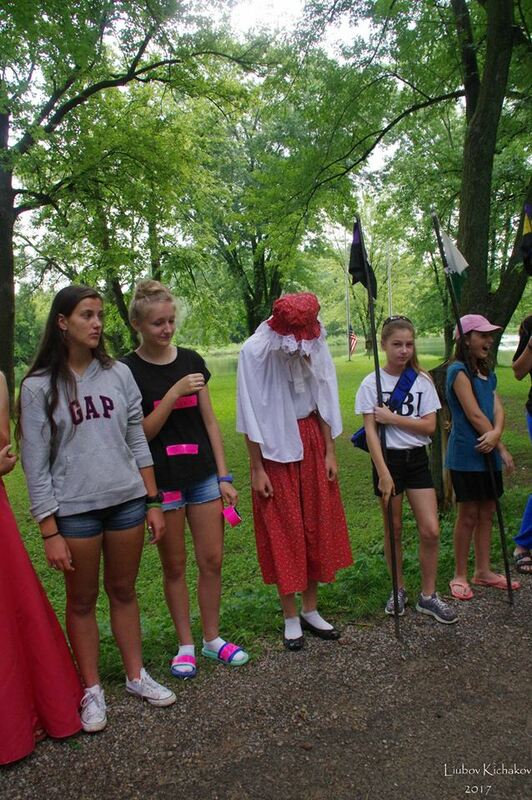 The theme was mystery and the cabins had to figure out what happened to a missing camper. They had interviews with his cabin mates, counselors, kitchen ladies, and even his girlfriend! They discovered that he had been thrown out of camp because he put gumballs in the borscht!! 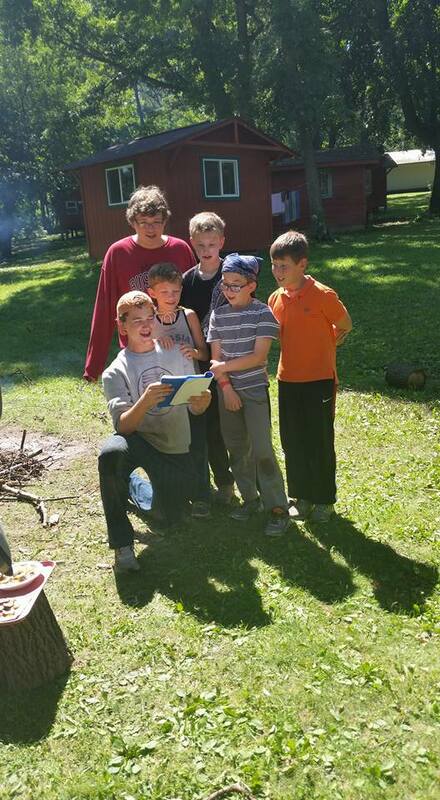 On Thursday, the counselors aided the cabins by lighting their fires for them in Varka. Once each cabin had their fire lit, they had to boil their water and make a soup. This week, every cabin made a super tasty soup that had the counselors begging for more! At last came Friday, the campers were excited to be a part of the third week "Ball." This year the cabin leaders had planned out a "Club Luxe" theme in which they renovated the barn into a dance club for the campers. As soon as anyone set foot into the barn they were amazed at how awesome the decorations were for this event! The dancing lasted all night long! the kitchen even made a delicious treat for all of the clubs "visitors." With the week coming to an end there was just one more day until the Vladimirovo festival. Campers had been working hard all week long in preparation for the major event. Their energy levels were high and they were excited to be able to perform for their families and friends. But less did the campers know that they would be pulled away from their practices during the day for a while. The counselors had surprised them with a shaving cream war by the lake. There were two sides (Boys vs Girls) and at the end of it all everyone was covered in so much foam! from afar it looked like everyone was wearing white t-shirts. The best part about all of this is that they all had big smiles on their faces the whole time! This past Sunday, we celebrated Vladimirovo Day with a ceremonial parade followed by the Vladimirovo Program. Campers performed two dances choreographed by one of our very own cabin leader Yulia Kornikova. 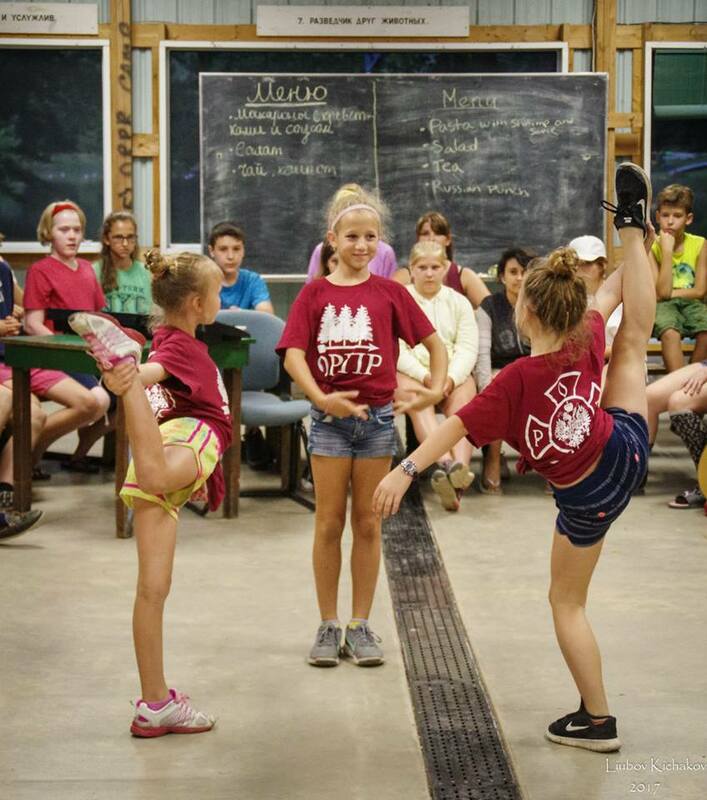 Mladshie (campers 12 and under) danced to a Russian song called "Я за то люблю Ивана." 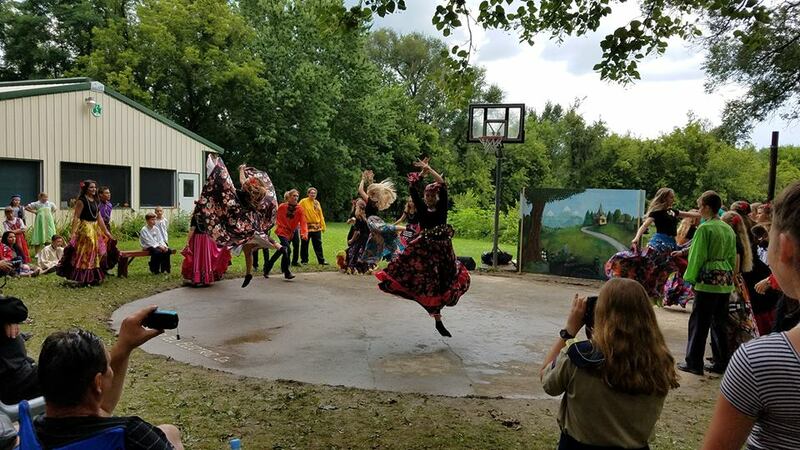 Starshie (campers 13 and over) performed a gypsy dance to the song "Мaхнатый шмель." Finally, the cabin leaders and nachalstvo choreographed a march to “Shagom Marsh” by Lube. After the program, campers spent some free time with their parents and relatives swimming in the lake and picnicking on camp grounds. Despite the heat wave campers and parents all enjoyed a fun filled Sunday at Lost Lake. On Monday we had keem. It was “kupaniye” themed, so counselors dressed in their swimsuits and splashed around with different pool toys such as beach balls and noodles. Campers were very enthusiastic about this keem because they love swimming time in the lake! On Tuesday, we had an army themed beg. Cabins had to go through “boot camps,” think of creative battle strategies, and had to recall basic first aid they have learned during their scouting classes. 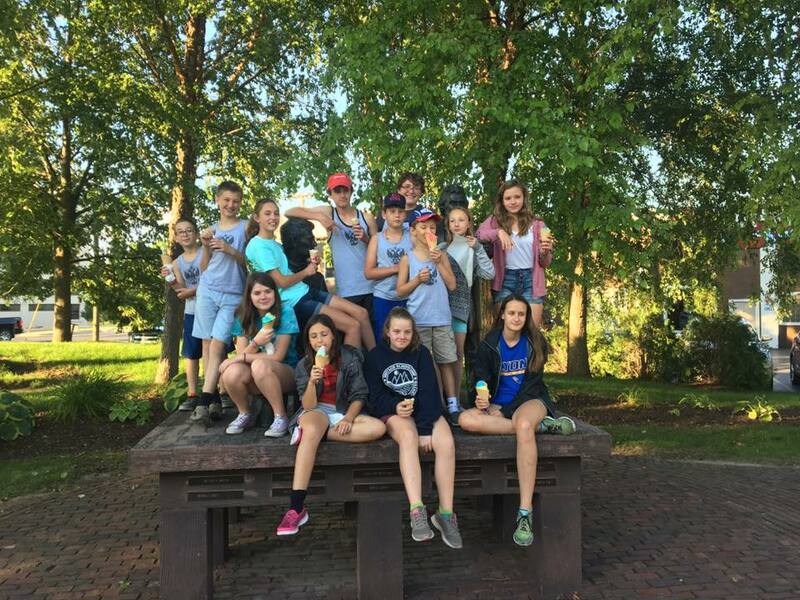 Although they were very wet and muddy afterward, campers were met by a cold refreshing watermelon snack when they got back to the cafeteria. Thursday was varka day. 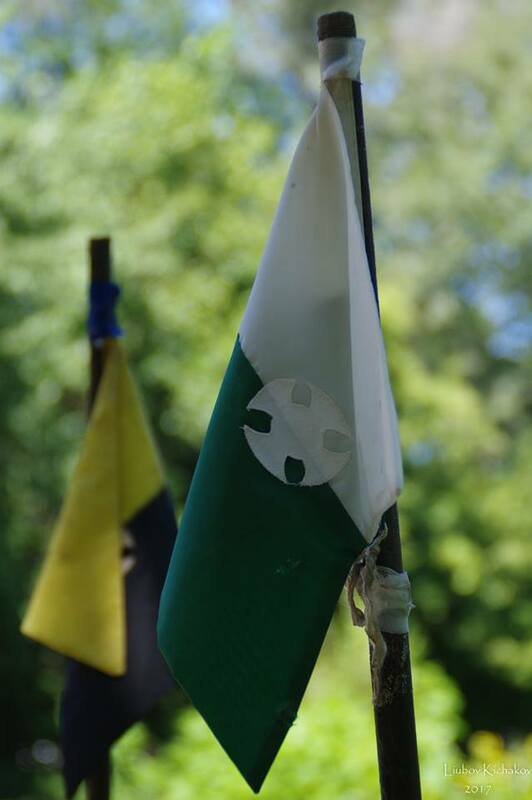 For this week’s twist, the counselors hid each cabin’s flag. After they found their flags, they were given an “advantage,” which they picked from a hat. For example, a cabin could have received an extra match, pre-made tinder, or help from a counselor. Cabins competed fiercely, but they worked together to make the day a fun one. On Saturday, we had another bonfire (kostyor). All of the campers had presented skits that their cabins created for the event. The night was full of laughter and joy as everyone was enjoying a nice relaxing evening. Friday Night Means "Tansi" Night!!! At last it was time for the Friday dance. All of the campers dressed up for a fun night of dancing, laughing, and singing in the barn. 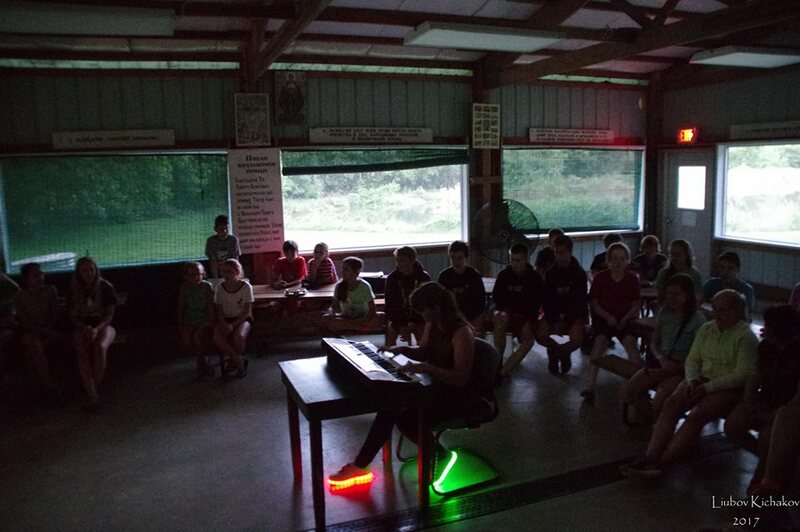 Underneath the disco ball, the campers listened to popular music from today, Russian pop music, and some "oldies." Campers also enjoyed a refreshing snack of Popsicles! 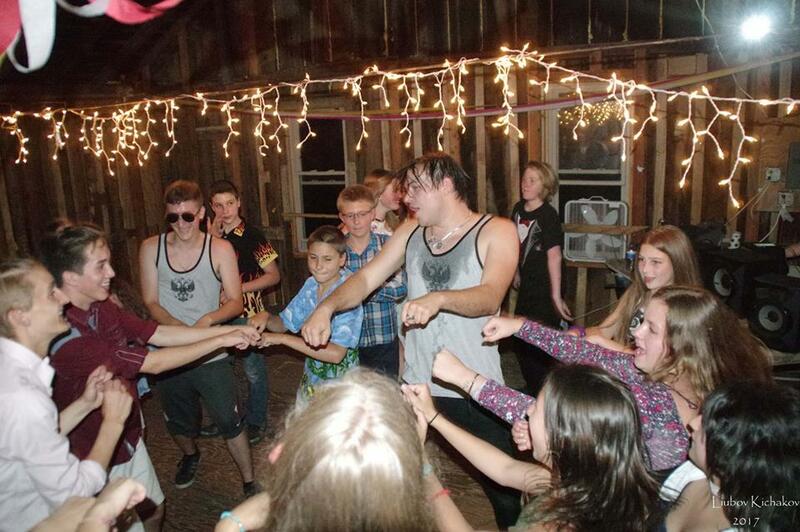 Even after the dance was over, campers were still humming and dancing in their cabins. They are SUPER excited for the future dances to come! As part of the activities that were planned for this second week of camp the counselors had planned a surprise trip for the camp on Thursday. The night before they announced to the cabin leaders that they will be going on a trip to Splash Land. The campers had found out about the trip in the morning and were excited for the rest of the day! The amount of energy was at an all time high, as the day consisted of non-stop fun activities. It was a pleasure to welcome all the parents and campers who were able to come out and help us kick off the 2016 camp session! After a wonderful opening ceremony on Saturday, campers are already adjusting to camp life and are making new friends. On the first night of camp we planned a bonfire. 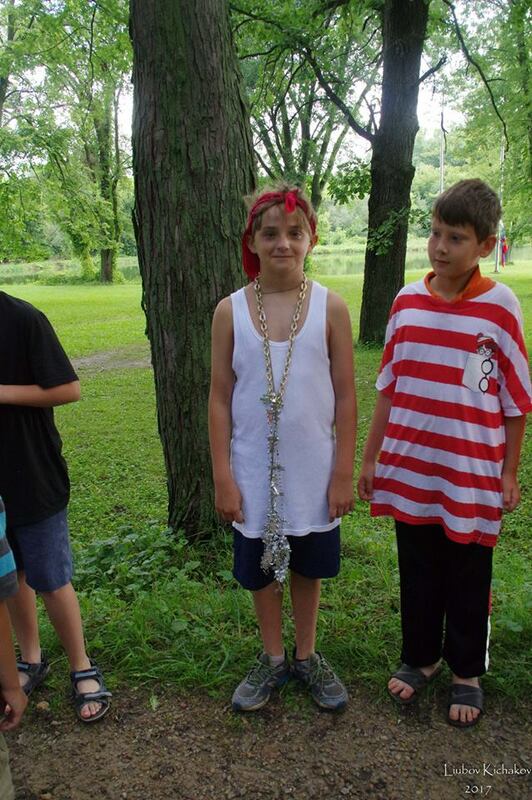 Cabins prepared skits and presented them to other campers to show a display of their cabin spirit. 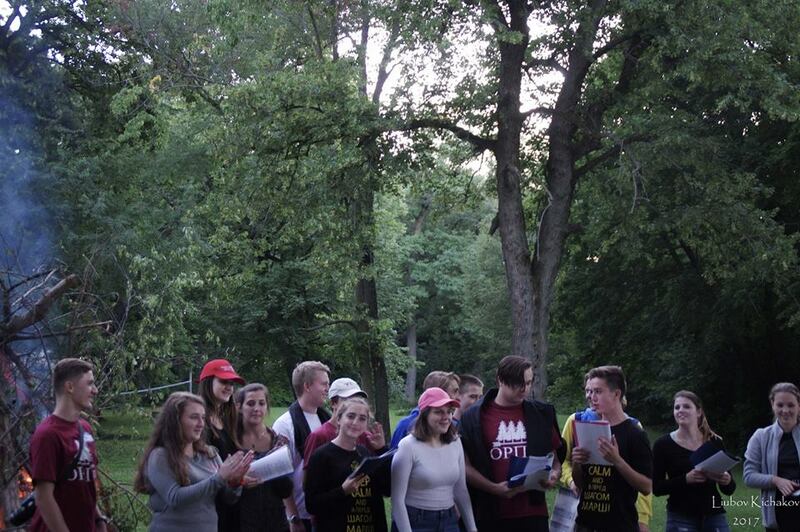 Campers also joined in with their cabin leaders and counselors in the singing of traditional Russian folk songs. Counselors also prepared an original song called "Eating Kasha with Me," which was about making new friends and eating kasha (oatmeal). Three days later, campers are still singing and humming the very catchy chorus! On Monday, cabins competed in a game called Keem. In this game, cabins must memorize items they see during a certain period of time. The counselors put a special twist on this weeks Keem; cabins had to memorize items they saw flying about their heads! All of the cabin members laid down on the ground side-by-side, and items were tossed over them. They had to memorize each item thoroughly so that they could write it down. Each cabin was very successful and they had lots of fun! Later in the day, campers dressed in all black clothing for night games. This week, they broke into 2 teams and played a camp-wide game of "capture the flag". The game consisted of two rounds in which campers put their tactical skills to use in an attempt to win the game for their respective teams. As a tribute to the USA on the 4th of July, the counselors held a red, white, and blue outfit contest! girl campers wore face paint, American flag headbands and earrings, as well as patriotic colored knee-highs! The boys also tried matching the color scheme by wearing festive clothing. To end the day, the entire camp sat on the beach to watch a very dazzling fireworks show. Campers enjoyed a tasty cake-pop to complete a wonderful day of celebrating our country's freedom! 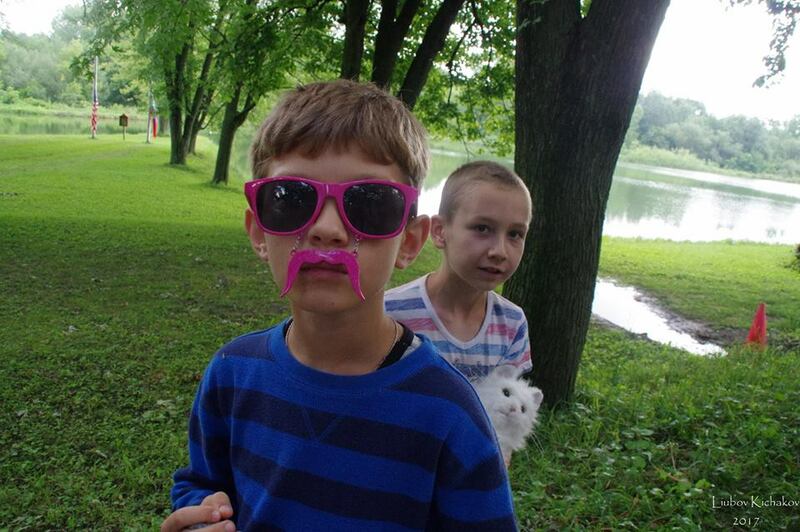 On Tuesday, cabins had a fun time outdoors in an activity called Varka. Varka is a very competitive activity where each cabin must build and light their own campfire. When they have their fire going, they must make a soup for lunch. They must then present their soups to the counselors with a creative skit. For Varka this week; the counselors dressed up as chefs from different countries and held a jelly-bean taste test. If the cabin guessed the jelly-bean flavor correctly, they were awarded an extra match to assist in their fire lighting. 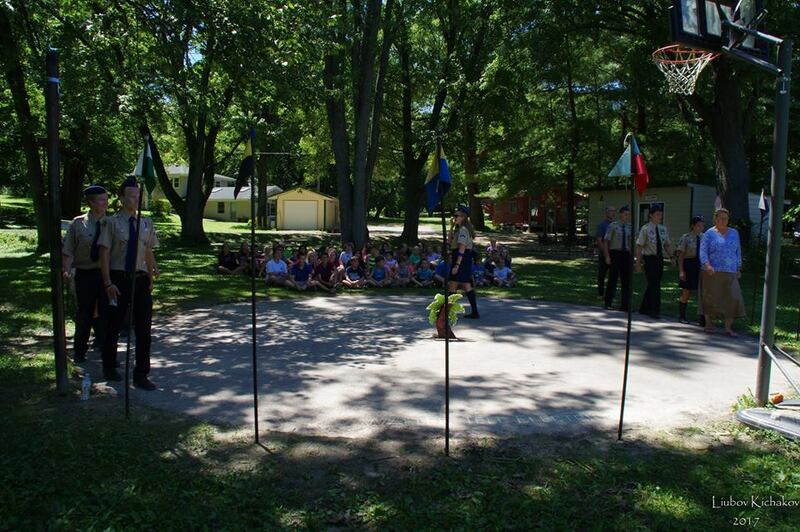 On Thursday, cabins competed in yet another major camp activity called "Beg". Beg is a scavenger hunt in the woods where cabins have to find hidden items. For example, they might see something as small as a battery on a log or as big as a hat on a tree branch. Cabins also stop at stations made by the counselors in which they participate in various activities. This week, counselors dressed up and had the campers slide down mudslides, splash around in the water, and play real-life fruit ninja! After Beg, the campers were caked with mud and enjoyed a fresh watermelon snack. To end the week on a high note, the entire camp gathered in the cafeteria to watch a movie. The room was rearranged in a movie theater style layout. Campers watched the movie "Zootopia" and a tasty snack as well! Overall, the first week was very successful. Campers have made many friends and wonderful memories. As everyone continues to bond even closer, the excitement is becoming even greater in anticipation for the next 3 weeks of activities and fun!